Okay guys, this recipe is gonna knock your socks off!! I gave my old eggnog recipe a makeover and created this creamy, sweet and incredibly tasty vegan, egg-free nog. This recipe is for all of you who can't or choose not to eat eggs. And if you're like me and you can and do eat eggs, I'm pretty confident you're going to like this recipe better than the traditional eggnog! 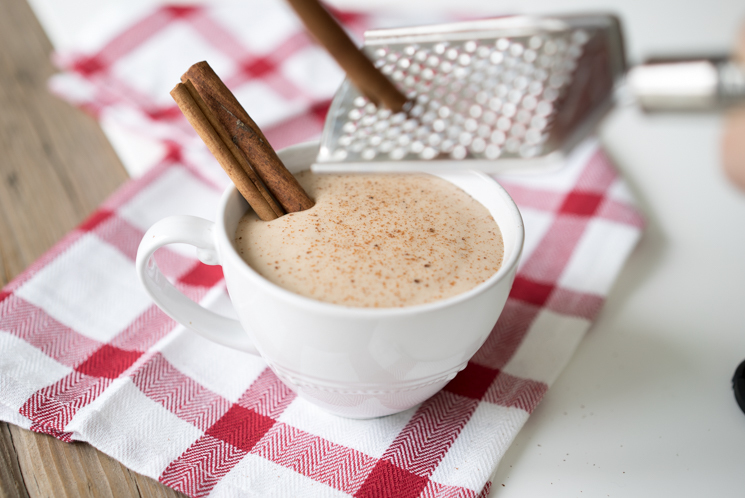 Two secrets to making this vegan nog incredibly delicious are the warming spices and the full-fat coconut milk. I used cloves, cinnamon and nutmeg, so I hope you have these handy in your kitchen pantry. I recommend full-fat coconut milk because it is truly the most flavourful coconut milk you can use. You can tell in the photo above that it makes for a very creamy vegan nog and creaminess is key!! 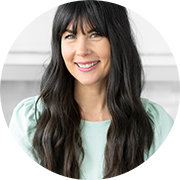 The good fats will not expand your waistline because they are mostly MCT's, a type of fat that your body effectively burns rather than stores. 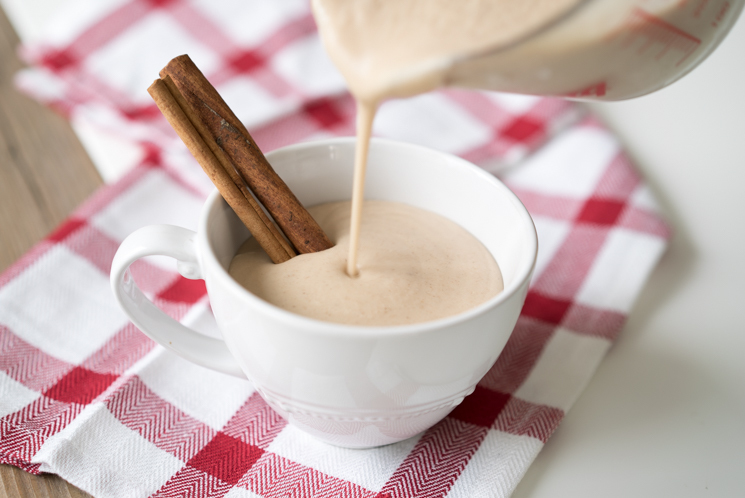 However, this vegan nog is pretty decadent so I recommend it as a "treat", not something you drink every single day because while I don't recommend you count calories, this one is definitely up there! But it's OH SO MUCH BETTER than you typical store-bought egg nog that is FULL of refined sugar. The sweetness in this recipe comes from the maple syrup and banana. Be sure to use dark (#3, Grade C) maple syrup. 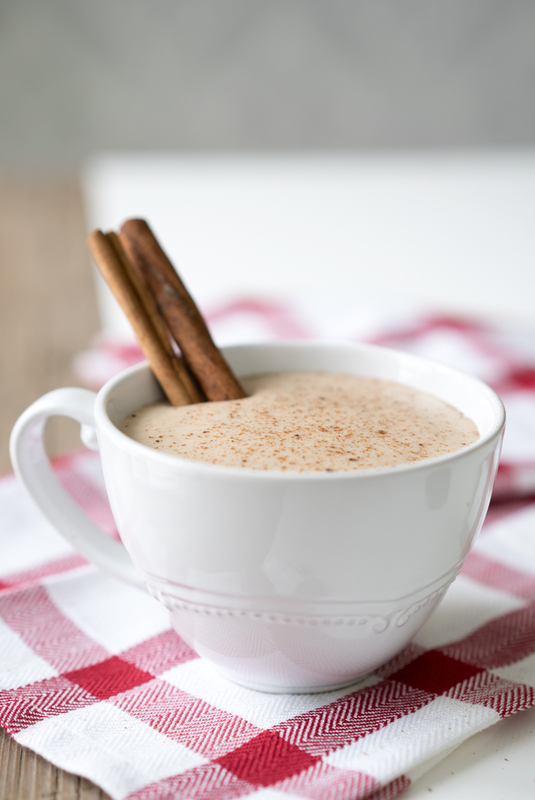 The key to the most delicious vegan nog is high quality ingredients because organic spices are very flavourful. Even though I always have ground cinnamon on hand, I grated the cinnamon fresh into the vegan nog because it's is the tastiest way to do it. Place all your ingredients into a high power blender and give it a whirl. If you refrigerate it overnight the flavours will be even more wonderful but it will definitely thicken up quite a bit so you might need to thin it out with a bit of coconut milk. Top with freshly grated cinnamon. *This type of maple syrup truly has the most "maple" flavour. You can buy dark maple syrup in the health section of most major grocery store chains and of course health food stores too. **Don't have vanilla bean powder? No problem! Just use the liquid extract. The brand of powder I use is by Organic Traditions. Or you could buy a vanilla bean pod and just scrape out the vanilla. The flavour is next level good! I hope you enjoy this recipe as much as Walker and I do! We are hosting our annual Christmas party this week and you can bet I'm serving this in shot glasses. I am desperate to try this but I have serious gastric upset from bananas so I banned bananas from my vegan diet. Can you suggest a substitute other than banana, even applesauce, which I do not care for. Thanks. I would suggest dates instead of banana. I recommend purchasing it online at a health store retailer. Just google it and I'm sure you'll find a bunch and then can seek out the best price. I like the Organic Traditions brand of vanilla powder because it's pure. While it's expensive, you'll have it for months. I served the nog to my guests on Christmas Eve and they loved it! I had them coming back for seconds and thirds. Thanks so much for the recipe! Hey gang Just wondered if anyone has tried to steam this for an eggnog latte? This is yummy. One question I made and sampled and then placed remaining in fridge for next day but now get after taste of soap! Should it not be left overnight? It's definitely best fresh, but I'm really not sure why it would taste of soap after being in the fridge all night. Did you have it covered so it didn't absorb any scent from your fridge? Hi Joy, this recipe looks wonderful but unfortunately I can't eat bananas. What can I use for a substitution? Soak 4 medjol dates and then blend them up with the other ingredients. Enjoy! I will never drink store bought egg nog again, this is delicious! I made it without the banana (mainly because I didn't have one) and it was still delicious! Glad to hear it was delish, even without banana Sandra! I'm allergic to eggs, always want to try the famous egg nug, thank you for this recipe.